This easy lemon mousse recipe is my favorite, and after you taste the mousse you will know why. Fresh lemons make this amazing. Offering the best lemon dessert recipes below. I love Ina Gartin, and she doesn't disappoint with this mousse. So refreshing and luscious (I could eat the whole thing). Go to the supermarket and grab some fresh lemons and let's get making this beauty. I have more than this easy lemon mousse recipe, please check out the recipes below. In a bowl, beat the 3 whole eggs plus 3 egg yolks (save 3 egg whites to beat later), and add the sugar. Stir in lemon zest and lemon juice. Mix well. Place bowl over a pan of water and cook until thickened as you stir with a wooden spoon. This takes approximately 10 minutes. Cover the custard with saran wrap and chill for two hours. After the custard has been chilled for at least two hours, beat the egg whites with 2 tablespoons of white sugar and a pinch of salt on high. Fold this mixture into the chilled lemon custard gently and place in a nice bowl. Put the custard mixture back into the refrigerator sealed with saran wrap. Beat the remaining cup of heavy whipping cream with 1 tablespoon of sugar and a splash of vanilla. Place in a nice serving bowl. Dollop or decorate top of lemon mousse with the whipped cream. Add halved slices for garnish. Enjoy. The following pie pastry crust is out of the world. It is buttery and flaky, and easy to work with. NOTE: I cannot stress enough that the butter, lard and water must be very cold. You may pop them in the freezer for a few minutes to be certain. Chill the dough down once more before it is rolled out. 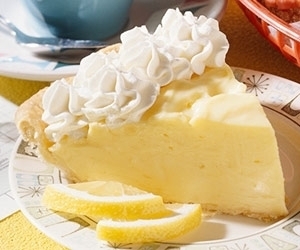 To prevent soggy pie crust, brush the bottom crust thinly with egg white. This recipe make two 9 inch crusts. In a small bowl, whisk the egg yolk, vinegar and water. Set aside. Mix both flours, sugar and salt together in a bowl. With a pastry cutter, cut in the very cold butter and lard until it looks like small peas. Add the yolk mixture in with this flour mixture, and stir until moistened and dough hold together. Gather into a ball and divide in two. Cover with plastic wrap and place in the fridge for 30 minutes before rolling out. Generously coat your work surface or pastry sheet with a little flour and about 1/4 cup graham cracker crumbs. Place dough on floured surface, coat with some flour and graham cracker crumbs, and roll into a 9-inch disk. Lift, coat surface with more graham and flour, turn dough, add more graham and flour on top, and roll out to a 13 inch disk. Place in pie dish and trim edges. Prick the crust with a fork so it doesn't bubble up. Place crust in oven and bake for 20 minutes or until golden brown. I have more than an easy lemon mousse recipe, please check out more of my favorite dessert recipes below.